Thanks and thank you again for sharing your information. It was a great help. I could not understand how the Drs. described the mating behaviour of an insect that it can barely be seen in the wild. I found out so many inconsistences in the papers that I finally declare useless, even confusing, so I decide not to believe. And it is a big relief, absolutelly. A small update on my project. There are now new BSFL in several containers of used coffee grounds and the rearing tub. I'm beginning to think that the females find the animal bedding on the bin bottom an attractive place to lay their eggs. I check daily and have only observed egg clusters in one of the containers but there are BSFL in all of them. I'm assuming that the larvae are migrating across the bin bottom. It would have been nice if the eggs had been laid in the flutes of the cardboard provided but the BSF are not following the plan and no eggs have been laid in the cardboard to date. The population of BSF peaked between 25 and 30 but has declined to about 15. There are still a few large white larvae in the rearing bin 45 days after the first flies emerged. All of this generation are from eggs laid around the end of September 2011. I check daily and have only observed egg clusters in one of the containers but there are BSFL in all of them. I'm assuming that the larvae are migrating across the bin bottom. The BSF had me fooled I was digging around a bit in one of the containers of used coffee grounds this morning looking at the larvae and discovered a clutch of eggs which was completely below the surface and hidden from sight. I thought they always laid their eggs on the sides of the containers or on the surface of their food but they proved me wrong. I´m starting to manage a huge amount of eggs and some babies are scaping from my nursery bin. In this case, velcro does not work and I tried a lot of substances without any results (peper, oil, and even deet (insect chemical repelent)). Propolis extract seen to be the best substance to repel the small babies from scaping. I made a trail with propolis extract near the lid of the bin... I´ll upload some pics of this nursery during this week. How about your experience? So far no escapees. My bin is completely inside a netting bag made from curtain sheers to contain any wandering larvae. A zipper in the screen provides access. I have not had any larvae (of any age) even crawl outside of the bin yet to test the netting bag. Although I've designed my bin to contain any wandering larvae I don't believe the young larvae will want to go anywhere as long as there's food and favorable habitat. I also vermicompost and have learned that you can't easily contain worms but rather you provide such an attractive habitat that they don't want to leave. I believe the same thing applies to BSFL, at least up to the age when they seek a site to pupate. I´m starting to manage a huge amount of eggs and some babies are scaping from my nursery bin. This may be population pressure related too. I only have a couple of hundred larvae. It will be interesting to see what happens when my bin becomes more crowded. The difference between the lux and the lumen is that the lux takes into account the area over which the luminous flux is spread. 1000 lumens, concentrated into an area of one square metre, lights up that square metre with an illuminance of 1000 lux. The same 1000 lumens, spread out over ten square metres, produces a dimmer illuminance of only 100 lux. My bin is about 1/4 square metre and the lights produce 4100 lumens which works out to about 17,000 lux or well below the values for sunlight given above. So the equivalent of full sunlight is not required for mating? In my experiment last summer the BSF were mostly inactive except when in direct sunlight. BW, My colony is under direct sunlight so I never made any research about artificial light. But I am an aquarism lover and I have one with a lot of plants. To keep then grow without sunlight I have to add CO2 and gave then a lot of light. Regarding light there are basically two things that I need to give then: The first thing you have discovered that is LUX, which means the quantity of luminous energy per some area. The other important thing that I have never seen anyone researching in BSF rearing is color temperature. Color temperature is the color of the light and is always labeled in light package as the unit K.
For example for my aquarium plants I need a color temperature around 7000k. For reef aquariums it is needed a 14000k. Some common lights used at home give no more than 3500K, i.e. they will never make any plants grow in a aquarium. Remember that in nature, BSF start mate near midday, when the sun is at top, that means around 7000k. So If I have to give you an advice I´d tell to give then not only lux, but an adequate temperature color. At this link: http://en.wikipedia.org/wiki/Color_temperature you could even see a picture of three lamps, all of them with the same lumen but with different color temperature. good luck in our studies and keep us updated! Thanks agropisa that's very informative. 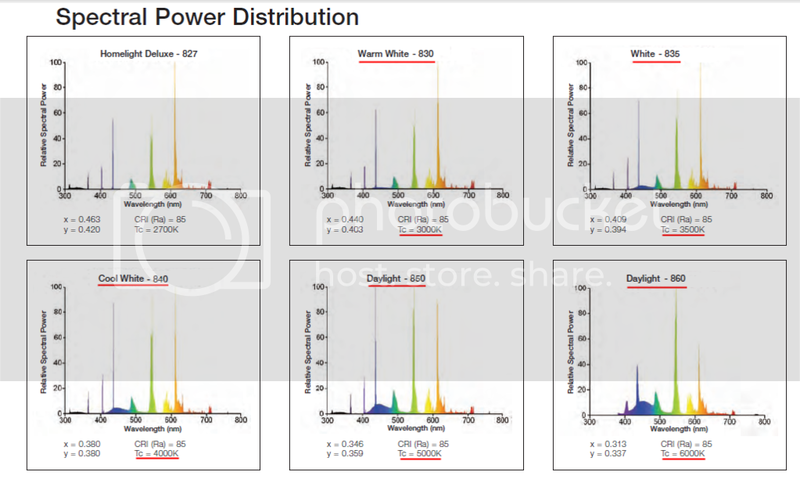 I checked the CFLs I'm using and the 14watt 900 lumen bulb is indicated to produce a color temperature of 2700K. I couldn't find a color temperature for the 23watt 1600 lumen bulbs but both types are labelled as 'soft white' so they might be the same. "µmol μmol m² s¹ unit refers to the number of photons (or particles) of light within the photosynthetic waveband that is received per second within 1 sq. meter of area"
The Chinese study also found that mating under natural sunlight peaked at about 10:00 while mating under artificial lights peaked at 13:00. I can't find the link right now, but I think this was from Osram. As far as I know, insects cannot see yellow light, so 'cool white' and 'daylight' bulbs look to be better than 'warm white' or 'white'. I´m sure that wavelenght has its importance in mating process, but the simplicity matter too! Try to use some 6500 k fluoresct lamps. Your 3500k has a yellow color similar to sunrise. 6500k has a more white color similar to midday. Regarding to lux, for aquarium you have to use from 0,5 to 1 watt per liter of fluorescent lamps. (for led lamps there are another regression since it has much more lumens per watt). So try to use this relation: If your area has about 200 liters you will need 200 w of fluorescent lamps from 10:00 am till 3 pm. If it works, reduce to 100 w and so on until you discover the minimum light.....but remember that mate does not occur in high intensity below 24ºC. The ideal temperature that I see more mating is around 27ºC. If this 6500 k does not work we can try some 14000 k mixed with some 6500 k lamps. This 14000k are hard to find. They have a deep blue color and has a much more energy than 6500k lamp! Remember to give water to your flies! The drink a lot of water and they don´t look for water, they need the water where they are... try to spray water in your cage time from time! If they don´t drink water they will die sonner! Your chart give us all we need to correlate... temperature color and wavelenght! Here's a short summary of lighting used by people who have been successful with indoor breeding of BSF. I hope to formalize this into a table which will be updated as new systems are reported. I've listed them in the chronological order that I discovered them. Note that we have a world wide community and some of these lights may not be available everywhere. From the manufacturers specs - The Bright Sun UV lamps achieve more than 100,000 lux at a distance of 30 cm. The Bright Sun are metal halide lamps which require a ballast for operation. 2013+ - Rated at a total of 3200 lumens (one 1600 lumen 23 watt 2700K and one 1600 lumen 26 watt 6500K). There has been no apparent reduction of activity of the BSF observed as compared with the lighting used in 2012. If you see any errors or have additional data please let me know (link). Last edited by BorealWormer on Thu Oct 23, 2014 8:46 pm, edited 4 times in total. and they have again I thought that perhaps the BSF were not ovipositing in the cardboard in my bin because the Used Coffee Grounds I use as an attractant were dry enough for the flies to lay their eggs in directly. As an experiment I added enough water to make the UCG soupy in a couple of containers and fitted them with lids that had cardboard on the underside. I have not found any egg clusters in my daily checks but this morning one of the soupy containers was swimming with tiny BSFL. I think I'll give up on the cardboard and trying to determine the rate oviposting. In my experience, they prefer the soupy stuff. Also they do not always lay a full cluster, but rather scatter their eggs around, a few dozen at a time. I'll bet those eggs were laid in the crack between the cardboard and the green plastic. ... I'll bet those eggs were laid in the crack between the cardboard and the green plastic. Could be. I took the circles of cardboard off the lids for a look this morning and didn't see any eggs but they could have been there previously and hatched out. I was checking the cardboard strips today and found that some of the larger sized flutes were blocked. It was not light colored clutches of eggs but something dark. I thought maybe the cardboard had folded over so I attempted to clear it out with tweezers and ending up removing a pupa! The mature larva must have figured that it was a good spot to pupate. The one removed was probably damaged/injured so the others were left alone. I checked the lids again today and found some desiccated eggs in the crack between the cardboard and the green plastic. It's been about a week since I last checked. My rearing tub was getting full so the larvae and substrate were transferred into a larger (1550cc vs 850cc) container. There are a lot of larvae in the 15-20mm size range and larvae/substrate weighed 1kg. I put up another short video too. Also picked up an indoor/outdoor thermometer and installed the wired remote probe in the rearing tub. I only see a difference of +2°C but it's a very small population of larvae. Martin/earthtiger reported an increase of over 21°C over room temperature (link).